As far as he was concerned, ships were built for sailing and sinking, nothing else. If ships were getting silly ideas like flying, what would be next, Neoschools? He shuddered at the thought. "Excuse me? I didn't ask for a response. I give out quests for no reason. I need items and I don't want to bother getting them myself. I also don't want to be bothered. I placed a sign outside my door so no one would come knocking bothering me and here you are all peppy and grinning asking what I want? 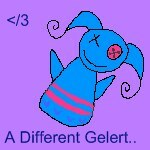 I want you pesky Neopets to stop bothering me..."
The Different Gelert: Your Weekly Dose of Different! "That was the reason they built Faerie City in the first place. It was to see just how much weight the clouds could support..."
What is the average Neopian to do during the down-for-maintenance madness? "Trying to steal another chocolate chip cookie, weren't you?" Sea King growled, with a hint of accusation in his voice, "Too bad you're too short, midget..."